This summer Juxtaposition Arts (JXTA) will build on the momentum they’ve created over the last 3 years around the celebration of Black August by combining the respective placemaking and art-based engagement skill sets of JXTA’s Public Arts, Tactical, and Environmental Design studios; using these skills to bring 2017 Black August programming outdoors on the intersection of Emerson and West Broadway Avenues in North Minneapolis. To set the stage, and in celebration of black life, JXTALab’s Public Art & Mural Teen apprentices will create a new on-site mural. This new mural imagines black life beyond surveillance and policing, while referencing the aesthetic style of Aaron Douglas. 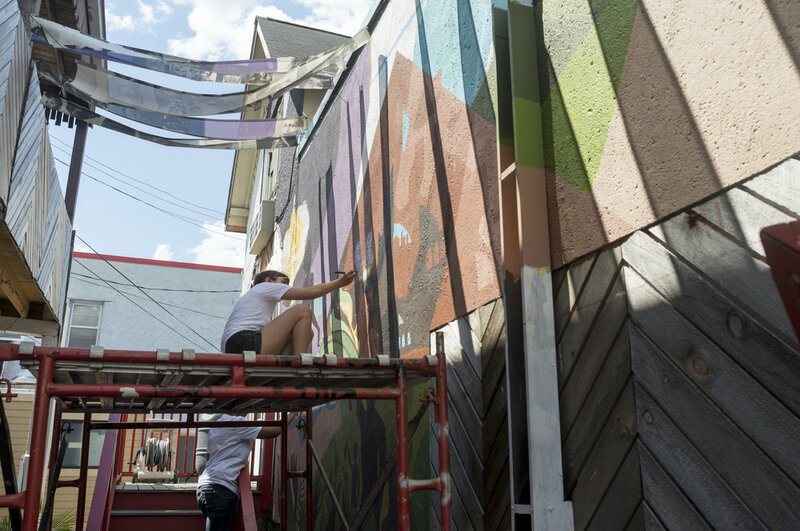 Please join us July 29th, during FLOW, the North Minneapolis Art Crawl, for outdoor programming and the unveiling of JXTA’s newly completed mural.